U.S. Marine Capt. John Watkins has to get creative when it comes to training for the Santa Rosa Ironman while deployed at-sea with the 13th Marine Expeditionary Unit, but he pushes through long runs on the treadmill and hours on the stationary bike because of the support from his family back home and the memory of his daughter, Amelia “Millie” Mae Watkins. Watkins is racing to raise money and awareness for neuroblastoma, a highly aggressive form of cancer that hundreds of children, mostly under the age of one, are diagnosed with each year. It is a cause that is close to the heart of Watkins and his family. In the summer of 2017, the Watkins family was traveling to California on military orders when they noticed that their 10-month-old daughter, Millie, was not feeling well. They stopped at the Phoenix Children’s Hospital where she was diagnosed with stage four neuroblastoma. Immediately following her diagnosis, Millie underwent five days of extensive chemotherapy and kidney dialysis. At only 10-months-old, young Millie’s body could not handle the treatment, and she passed away. While in the middle of a strenuous pre-deployment training program with the 13th MEU in April of 2018, Watkins participated in his first half-Ironman in Oceanside, California, to raise money and awareness in the memory of his daughter. The Santa Rosa Ironman in May will be his first full-length Ironman. Watkins is the battery commander of Bravo Battery, Battalion Landing Team 3/1, 13th MEU. While deployed, Bravo Battery has strengthened partnerships in Sri Lanka and sustained combat proficiency in Djibouti. 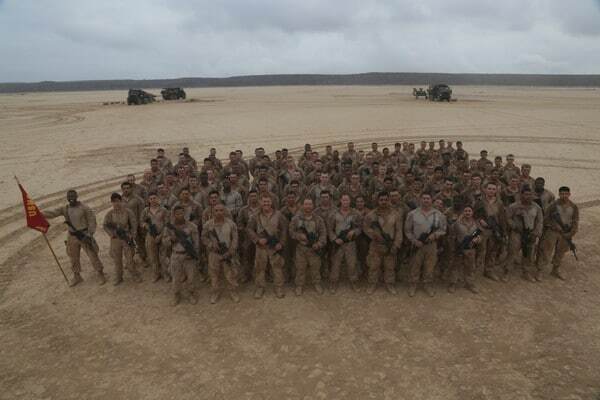 The battery also conducted operations in support of the defeat-ISIS mission in southwest Asia while attached to Special Purpose Marine Air-Ground Task Force, Crisis Response-Central Command. The Essex Amphibious Ready Group and the 13th MEU are currently deployed to the U.S. 5th fleet area of operations in support of naval operations to ensure maritime stability and security in the Central Region, connecting the Mediterranean and the Pacific through the western Indian Ocean and three strategic choke points.